Yesterday began at work, as usual. I had my egg/sausage/cheese bowl, made by Rick. Lunch was 2 hotdogs microwaved in the last of the chili. At the end of the workday, I got some more bad news. Another friend passed away suddenly over the weekend. When I got home, I decided to have a drink, and a vodka and Diet Coke provided a no carb option. Brandon and Lindsey dropped by to let me try some wings they picked up from Buffalo Wild Wings. I don’t usually eat traditional wings. I’m a bonelss wing fan. However, each wing is only .3 grams of carbs, so I had to give it a shot. 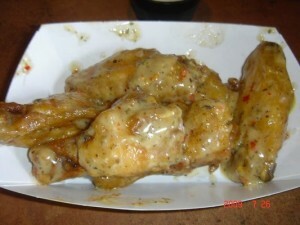 They were parmesan garlic wings and they were pretty good dipped in blue cheese sauce. I could definitely get used to them at 3 wings per one carb! Rick makes a really good meatloaf. Last month, he tried to adapt it to the keto plan, but I thought the ground pork rinds made it too bitter. This time, he substituted chopped cauliflower and the results were much better. The only thing missing now is the barbecue sauce, but the only really low carb option I found is about $21 for 6 bottles online, and I’m not sure I want to commit that much money to something I haven’t tried yet! 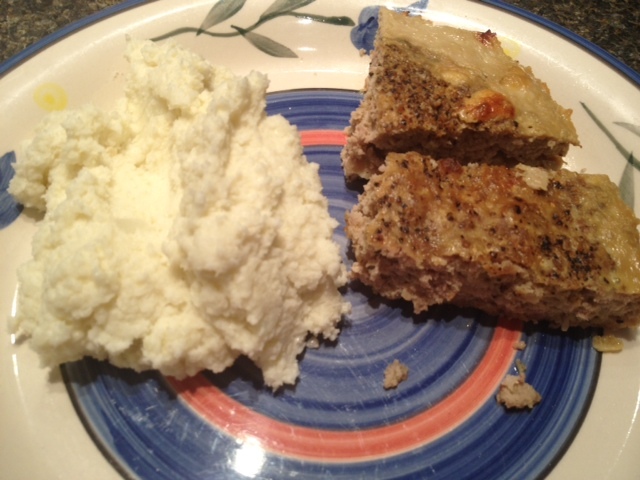 I made the faux cauliflower potatoes to go with the meat loaf. Doesn’t this look like a traditional meat and potatoes dinner? Dessert was sugar-free lime jello mixed with cream cheese.